EliteMMO Network • View topic - FantasyWarp v2.0.0.0 Released! Post subject: FantasyWarp v2.0.0.0 Released! Tonight I bring the newest version of FantasyWarp to life! [CHG] Full UI redesign. FantasyWarp is now in a nice and clean compact UI style. [CHG] Complete rewrite to the rendering code to give a better, flicker-free, experience. [ADD] Added the ability to zoom in and out of the map. 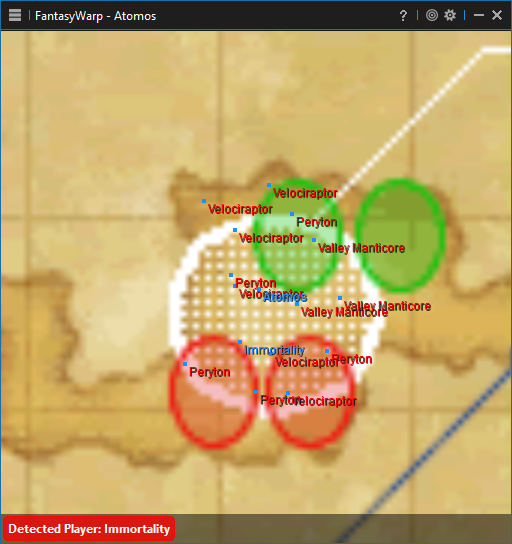 [ADD] FantasyWarp's radar rendering can be customized via the /Data/RadarEntity.xaml file. [FIX] Fixed issues where some maps would not load at all. [FIX] Fixed issues where some maps would not properly load various floors. [FIX] Fixed issues with mob scanning sometimes showing/detecting invalid players. [FIX] Fixed issues with the zone delay timer not working properly. Donators can access the new FantasyWarp immediately in the donator-only section of the forums! Want access to FantasyWarp and other premier applications? Consider donating to the EliteMMO Network to show your support and gain access to quality applications and information for various games!